This article first appeared in The Edge Financial Daily, on November 23, 2016. 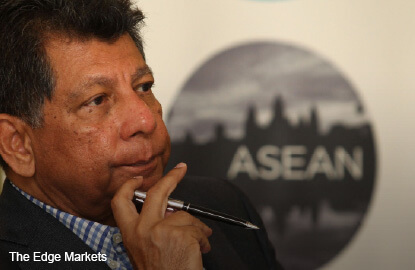 KUALA LUMPUR: With the possible rise in protectionist trade policies in the US under the Trump presidency, it is now more important for Asean countries to strengthen their economic integration, said CIMB ASEAN Research Institute chairman Tan Sri Munir Majid. “The Asean economic integration assumes great importance to generate greater economic activity, especially because of slower world economic growth and now, more critically, because of potential anti-free trade and protectionist measures by the Trump administration,” he said after the Asean Roundtable Series on “Connecting the Region Through Master Plan on Asean Connectivity 2025” yesterday. “Asean businesses must understand the challenges of the international political economic environment and should appreciate the objectives of growth that come from integration in Asean,” he added. The Roundtable Series was organised by the CIMB ASEAN Research Institute in collaboration with the ASEAN Business Club to discuss the initiatives of the Master Plan on Asean Connectivity 2025 (Master Plan 2025). Master Plan 2025 will focus on five strategic initiatives in the integration of the Asean economic community, which will include the targeted improvement of infrastructure, digital innovation, logistics efficiency, the movement of people within Asean, and regulatory practices and procedures within Asean. Meanwhile, Munir, an ex-banker, also commented that now is “not an easy time” for banking loans, particularly the retail, automotive, mortgage and personal loan segments, which have felt the effects of global economic uncertainty. Munir said banks should pay attention on how these sectors are being affected by higher prices, lower growth and stagnant incomes against their existing liabilities and potentially higher interest rates amid the challenging economic outlook.